The floor at the Highlands gymnasium has buckled due to water damage. Brand new bleachers and a jumbotron are seen in the background. FTM file. The Fort Thomas Independent Schools Board of Education passed an emergency measure yesterday to approve the replacement of the hardwood court in the gymnasium, which is currently under construction. The BG-1 measure, which passed unanimously by the Board of Education, will be sent to the Kentucky Department of Education for approval immediately. Superintendent Gene Kirchner said that the need for the emergency meeting was to speed up the process of awarding the contract so that work could begin immediately. The Board of Education meets in Superintendent Gene Kirchner's office to pass the emergency measure to award a contract to replace the damaged gym floor. A torrential rainfall hit the area on September 4th and a large amount of water seeped onto the maple hardwood which was covered in plywood to protect it during the construction process. The moisture caused the wood floor to buckle and according to the insurance company which assessed the damage, the entire floor and possibly the subfloor would need to be replaced. The floor was last replaced in 2012. 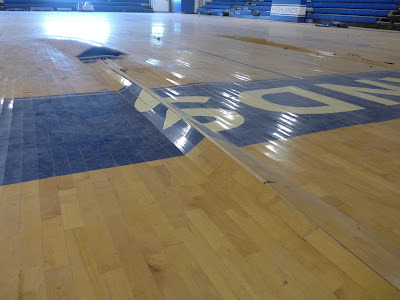 The contract to replace the floor was awarded to Cincinnati Floor for $192,000. According to Kirchner, he received a verbal agreement to that amount by the insurance company which would be paying the claim. The Board of Education included $19,200 in construction contingencies for a total project cost of $211,200. Included in that $211,200 is a base price to replace the floor at $129,500. $22,000 is for the reinstallation of the brand new bleachers. The company who installed the bleachers must take them out and reinstall them after the floor is put in so as not to void the warranty. The cost to replace the subfloor is priced at $17,000, but whether or not it can be dried is still up for debate. Century Construction's insurance will be paying for the repair in full. Work to begin demolition of the damaged floor will begin Monday. 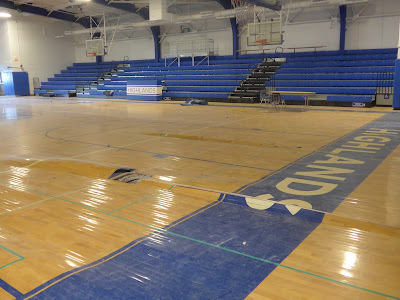 Kirchner said that once the old floor is taken up and the area is water tight, the gym will be ready for use within six week. "Our best case scenario is to have things up and going by mid-December," he said. "All the coaches have all been very cooperative. This floor is only three years old and we don’t want to give the community anything else than a brand new floor. Century Construction has been cooperative and the insurance company, for the most part, has also been pretty cooperative as well." During the fall, the Highlands volleyball team normally uses the gym for its games and practices. Their games have been moved to Highlands Middle School and Woodfill Elementary. The boys and girls basketball teams will also be impacted with practices beginning in the next month. The girls basketball team has a game scheduled against Sacred Heart (Louisville) on December 1. The boys basketball team has their first game scheduled at home on December 19 against Brossart. "In this situation, we can choose to make lemonade out of lemons," said Kirchner. "If we are spending $5 million to completely renovate our gym, a brand new gym floor is now going to be apart of it. I hate it for the volleyball girls, though. They’ve lost their season and the board is regretful for that, but there is a silver lining." Phase IV of the Highlands Renovation Process was a $5 million dollar renovation that completely revamped and reshaped the gym facilities, including new entryways, new scoreboards and new bleachers. 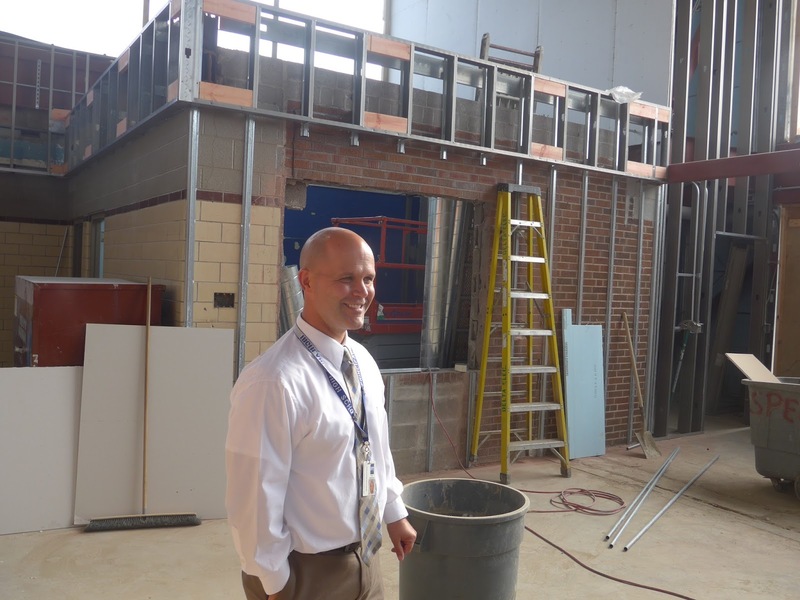 Highlands Principal, Brian Robinson, shows the new entryway of the Highlands gymnasium. FTM file. Is this new gym floor going to be installed before the building is fully closed and conditioned? It makes not sense in replacing it until the building is sealed and the mechanical systems can maintain a proper temperature and humidity level. 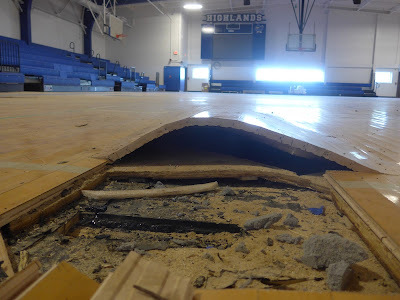 I wonder if it would be possible to salvage some of the flooring so it could be donated to the Campbell County YMCA. The court is in need of replacing. Why is the school's insurance paying for this? Sounds like the construction company is at fault. Why aren't they or their insurance paying?????????? According to the article, Century Construction's insurance is paying for the repair in full. Was it stated the school's insurance company or Century Construction?